Last night was definitely a hectic night for me! I believe everyone should work as a server/bartender once in their life to really know what it's like. Until they do, I don't think they will ever understand how demanding it can be! Patience is a virtue people! I have been working in the hospitality industry for a total of 3 years. My first job was in Northern Michigan as a hostess/busier hence I couldn't serve since I wasn't 18. You have to be 18 to serve alcohol. I worked for a small little restaurant that wasn't as demanding as the job that I work at now. Of course, living in the a city definitely draws in more traffic than from a small little village, & yes I said village, in Northern Michigan. When I moved to a much larger city in Florida, I was told to come into this Tapas bar to apply. I had some friends that moved down, a year previously, that were working at a bar/lounge within the same company. I dropped their name, and applied. That evening I was hired as a hostess. There is nothing like starting at the end of the ladder and slowing working your way up to the top. I was pleased with finding a job though within the week of living in Florida, and the pay was definitely much better that what I was getting paid in Michigan. So within 8 months, I was pulled up as a server; a whole new aspect of interaction with people. There are definitely pros and cons to working in the hospitality industry. The ability to meet new people is definitely a great aspect. Through life, I believe connections are a big key in succeeding in your overall goal. Knowing others will always allow people to put in a "good word" for you! Hence my name drop! =) But there are some occasions where people work extremely hard to get where they are today, knowing people or not! I guess it can go both ways. Once we get in, we have to work hard to get to the top. I definitely take pride in my job for I work hard for what I have. I definitely want to make sure people are satisfied with their experience! To be too attentive or not: The way I look at it, you rather be more attentive than not. You want to make sure you are there when they need something. I rather them be more annoyed with me then angry! Some people may consider this a good thing or bad. I'd have to say I really haven't had any trouble with this. You usually get the feeling when someone just wants to be left alone especially those who are on their first date. Drive by: Yes, I called them drive by's. With being attentive, but not interrupting. I usually put this within my loop of things while working. I'll walk pass the table, not say anything, and attempt to notice if their drinks are empty, along with dirty dishes, etc. This allows me to know whether or not to come back with a water pitcher, or clean off their dishes. With this as well, this allows them to possibly to notice me, and let me know if they need anything! & by the loop, there are numerous of things we have to do then just attend to our tables. My loop: starting with greeting the table. Beverage napkins; this allows people to know we have been to the table, Greet customers, explain our menu, grab waters, take drink orders, grab drinks, take food orders, ring in food in the computer. Within this time, you have "free time". This consist of, running food to tables, and not just our own food, throughout the whole restaurant, bringing up plates from the back, restocking the plates, back to attend the table(s), and within this time we most likely have been given another tables. Back to the loop. Let me add, this may include filling ice, making more coffee, making more tea etc. This takes more time then you think! Now I can say having a section is by far way easier than having tables everywhere. But when they are in the same area, I like to treat it as one whole table! Being Knowledgeable: This is definitely a key when working as a server especially where I work. Most people don't know what tapas are, so explaining this is very helpful to the customer. What are tapas you might ask? Tapas are small plates, kind of like appetizers. Usually we recommend for people to order 2-3 per person and everyone can share! Definitely allows a great opportunity to try a bunch of different things; seafood, chicken, steak, and vegetable dishes. But if you are not about sharing your food, entrees are available too! These are full meals like any other restaurant serve with rice and black beans. Tapas are definitely great for larger groups! Interacting with the table: I believe this aspect is by far one of the main keys while serving. Allowing yourself to get to know your table opens all doors. They start to fill comfortable with you, hopefully. This will allow some key factors: come back again and ask for you; creating regulars, possibility a discount on their end, opportunities within career jobs, higher tabs, better tips, and so forth. It's all about the experience. I try to be as helpful as possible. Now that I have gone through a run down on some positive things regarding serving. Let me go on to some things people may not consider while out and about! Yes, customers are VERY important to us. But we are human too! Wanting to be in everywhere at the same time just can't happen. Now, yes you'll get the server that slacks within their job but for myself, I consider myself a working machine. Once again, I work hard for what I have! Last night I felt like I completely failed. But not because I slacked in what I was doing but because I got "weeded". Servers/bartenders do get weeded; too much to handle in ones' time frame. One thing I feel customers should always consider, look at how hard your server is working. If you need something, be patience. If you can see them running around with their head chopped off, be considerate. Look at it this way, you see that they are working hard rather than not doing anything at all. Well, what do you do when you don't see them at all? Well most likely they are in another sections; these will be nights where your tables are all over the place (bigger loop of course), and soon to be coming back over. But don't get me wrong, sometimes it could be the case where the server could be slacking. Most of the time, nights like these are considered nights where we are understaffed and the people working can only do so much. Usually we don't have time get organized as much as we like! One thing I always try to do is, be honest with my tables. Tell them what's up; sorry the kitchen is a little backed up, the bartender is swamped; it may be a little bit before you get your drinks, and so forth. Some people may take this in consideration but others just don't care. Within our restaurant, it's a little different because we are tapas restaurant, all the dishes come out as soon as they are done and not all together unless you have entrees of course. So completely that loop is very important! Usually we have a food runner that completes this task with the help of all the servers on the floor. But sometimes that can get overwhelming as well. I believe all restaurants can get to this point. What percentage do you usually give? & what factors do you usually consider when tipping? Being in the industry, I notice a lot of things when I go out. For me, the server has to be polite, and friendly. And being attentive is important to me! 10% to 15%- they were okay. 20% (the average tip) and up- they were excellent! What makes you tip more than 20%? 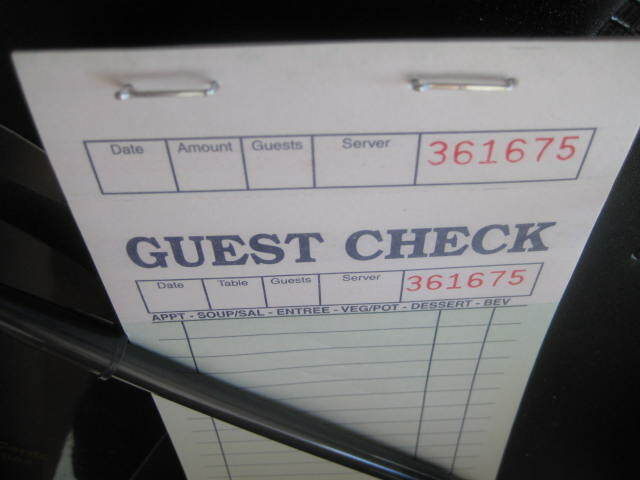 FYI: Yes, discount saves you money but tip your server on your regular bill!